Many who fall in love with Oriental rugs often do a great amount of research before making a purchase—or very soon after they’ve inherited one of these stunning masterpieces. While it’s usually a journey that starts with such things as knowing what types of rugs are best suited for certain areas of the home or what to look for when buying a handmade rug, it typically evolves into a strong desire for more information. Nevertheless, even advanced researchers and collectors don’t always know all of the terms that are part of this complex, but creative global industry. So to assist anyone looking to improve their rug vocabulary, or better understand the origins and significance of certain terms, we’ve put together a glossary that contains many of the most utilized names and phrases in the rug world today. Abrash: Color variations found within a single color on Oriental rugs. While abrash can be found in older rugs, it’s typically discovered in rugs manufactured in tribal or nomadic cultures, where inconsistencies in dyeing or the insertion of new wool batches can make its colors vary. Afshar: A Turkic tribe located in Southern Persia known for their small handmade rugs and other items. Agra: A city located on the border between India and Pakistan where many large antique carpets can be found. All-Over Design: A pattern without a central medallion that is spread across the entire field of a carpet. Anatolia: One of the more prolific rug-producing countries in history that is today known as Turkey. Aniline Dyes: Manmade, synthetic dyes used to color a rug’s materials prior to its manufacture. Antique Wash: The natural aging process taking place in a carpet where its dyes naturally diminish; also refers to the chemical process this same type of appearance. Arabesque: An intertwining floral and vine design featured on many Oriental rugs. Asymmetrical Knot: Also known as the “Persian” or “Senneh” knot, this knot is made by pulling a strand of wool under one warp and then over and under the adjacent warp. BaktiyarI: Part of a larger confederation in central and southwestern Iran, the Baktiyari nomads produce large carpets that usually consist of garden themes. Balouch: A group of nomads living across Afghanistan and eastern Iran whose rugs often feature darker tones. Bleeding: Also known as color-run, it is when a rug’s dyes have become unstable and combined with other neighboring colors to create an unintentional variation in colorings. Border: The “frame” of a carpet that surrounds the largest woven portion known as the field. Boteh: A pattern used in rugs that is often referred to as a paisley pattern, representing the sacred flame of Zoroaster or a Cypress tree among others. Brocade: An embellishment with a raised pattern that is usually produced by “floating” a design over the carpet’s foundation. Camel Hair: A soft and radiant rug material sometimes used in antique rugs or those produced by nomadic peoples. Carpet: In general, any handmade pile rug greater than 5’ x 8’. Cartoon: A hand-drawn representation of a rug’s design prior to its manufacture. Cartouche: An oval-shaped design that usually features some kind of inscription or date. Chemical Wash: A technique of using a chemical bath to remove “bad” color from a rug, which often results in color changes or aging of the rug by stripping the natural lanolin from the wool. Chichi: A Chechen name for tribal rugs and the manufacturing of rugs in the Chechen region. Cloudband: A stylized cloud motif originally found in Chinese designs but also found in Persian rugs. Color-Fast: Despite years of use, washing and sunlight exposure, a dye that preserves its original color. Condition: The state of a rug in terms of its overall appearance when examining its surface and construction. Cotton: A natural plant fiber typically utilized by rug weavers in warp threads. Dragon: A design used in Chinese rugs to symbolize good fortune. Dhurrie: A flat-woven rug produced in India that is usually more affordable than other rugs of the same quality and region. Dusting: The removal of dust from a rug, usually performed by hand or with specialized rug dusting equipment. Embroidery: The process of adding needle-worked stitching to a rug or textile using a variety of techniques. Edge: The longer sides or length of a rug which is typically finished with selvedges to make it more durable. Ends: The shorter sides or width of a rug where the flat-woven area is located. Engsi: Also known as Hatchli, a rug traditionally used by tribal Turkmen to cover a tent door. Ersari: A group of tribal weavers living in South Turkestan, Central Asia and northeast Afghanistan. Farahan: A district located in North Persian known for creating rugs of the same name. Field: Often referred to as a rug’s background, it is the inner area of a rug or carpet contained within the border, and featuring the largest portion of the rug’s design elements. Flat-Weave: A technique where the weaver doesn’t use knots to assemble a rug, instead using the warp strands as the foundation, and the weft strands as both foundation and design. Foundation: The base of the rug, consisting of both the warp and weft, to which knots are attached to form the pile. Fringe: The strands of warp threads extending beyond the foundation of a rug that keep the wefts from unraveling. Garden Carpet: Known as Kheshti in Iran, a design that was common in early Persian rugs, displaying floral or garden motifs. Gabbeh: Translated from Farsi to mean “raw” or “natural”, these are some of the most noteworthy tribal rugs emanating from Iran’s tribal villages. Ghiordes Knot: Also known as the Turkish knot, it is the second-most utilized knot in rug weaving. Guard Stripe: Sometimes referred to as the minor border, it is the narrow border surrounding one or both sides of a carpet’s main border. Gul: Translated from Farsi to mean “flower”, this refers to octagonal designs or medallions typically found repeated on Turkman rugs. Haji Jalili: One of the most well-known and respected rug weavers in history who created some of the finest Tabriz rugs ever produced. Hali: The Turkish word for rug. Halicilik: The Turkish word for a rug seller. Hamadan: A prolific rug-making district located in northwest Persia which manufactures exquisite rugs of the same name. Handmade Rug: A rug made by hand by a weaving artist which is of higher quality than machine-made rugs. Herati: A design featuring four leaves woven around a diamond and sometimes called the “fish design”. Hand-Tufted: A gun-like device that pushes fibers across a hot latex foundation that has been imprinted with a design. Hereke: A city located in western Turkey known for producing extremely high-quality rugs of the same name since the existence of the Ottoman Empire. Heriz: A small village in Iran known for manufacturing Heriz rugs, which typically feature large geometric medallions in rich color palettes. Hooked Rug: Also known as a “loop hook rug” or “latch hook rug”, it is a rug produced with a hooking device that pushes and loops yard through a canvas backing. Indigo: The natural color originally derived from indigo plants growing in the wild in areas surrounding rug-making centers, but often designed synthetically in modern rugs. Inscription: Any script woven into a rug, usually denoting the date the rug was produced, the name of the weaving artist, a religious word/phrase, or quote. Isfahan: A carpet produced in Central Iran featuring a distinctive floral design with very high knot counts and sometimes on a silk foundation. Joshaghan: A city located in north central Iran known for producing rugs that feature lozenge or diamond patterns made up of a geometric floral style. 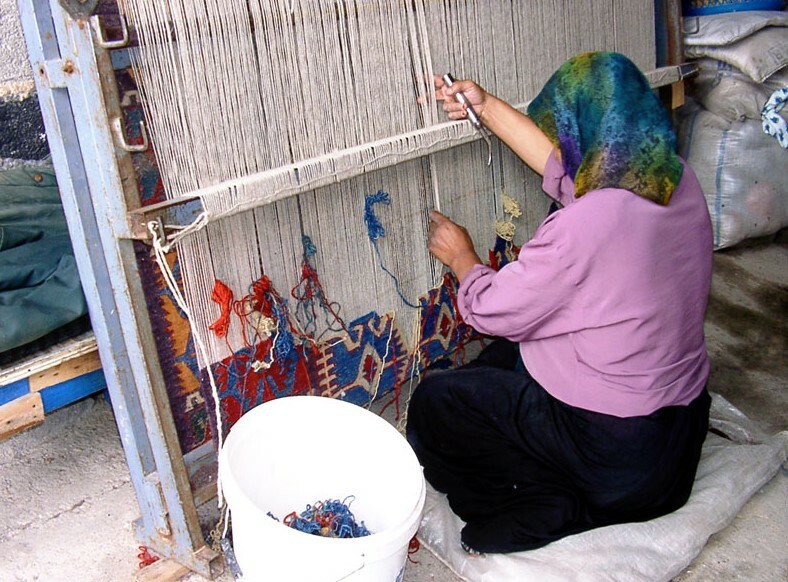 Jufti: A Turkish knotting process where knots are tied over four strands instead of the typical two strands, resulting in a less robust and looser rug. Karabagh: A rug known for being woven by Armenian tribes located in the southeast Caucasus. Kazak: Known by Westerners as the Cossacks, the Kazaks are a tribal group located in the southwest Caucasus who manufacture very notable and collectible rugs. Kerman: A city located in southeast Iran where rugs featuring highly stylized floral designs under the same designation are manufactured. Kilim: A flat-woven rug where the weft yarns fashion the flat-looped face of carpet. Knotted: The traditional method of assembling an Oriental rug where knots are painstakingly attached to the warp and weft to produce designs. Kurd: A tribal group living in Kurdistan, which covers parts of Iran, Iraq and Turkey, and whose rug weavers produce beautifully rendered tribal rugs of the same name. Lavar Kerman: Similar to Kerman rugs, these are typically older carpets featuring a fine floral design made by residents of the southeast Iranian city of the same name. Loom: The frame or machine used in the creation of Oriental rugs and textiles, where two or more types of stranded materials are interlaced. Lori: A tribal group that manufactures Lori rugs in southwestern Persia and in the plains of Veramin, which is located in North Persia. Lozenge: A diamond-shaped design which is shaped like a rhombus or parallelogram. Macrame: When a rug’s fringes are twisted together into a unique latticework. Mahal: A city located in Central Iran where Mahal rugs are produced. Malayer: A city located in the Hamadan Province of Iran where rugs of the same name are produce, usually consisting of thin vertical lines running lengthwise along the rug. Medallion: A large design centered on a rug’s field and usually containing other elements within its design. Mihrab: A design representing the niche or chamber of a mosque usually found on prayer rugs. Mina Khani: A beautifully arranged design displaying flowers, usually daisies, connecting together in a diamond-like or circular fashion. Mordants: Metallic salts derived from iron, tin, copper and aluminum that assist in the dyeing process. Motif: A design element that is either featured once or repeated across a rug. Mughal: Any rug or carpet created during the Mogul King period and exhibiting unique stylistic likenesses and antiquity. Nap: A term that describes which direction the pile falls, and is created by the cut made by weavers when completing a portion or the entirety of the rug. Navajo: A Native American Indian tribe located in the southwestern United States, and also refers to the types of flat-woven rugs produced by the tribe. Ninghsia: An antique rug originally produced in western China. Oltenian: A classification given to Kilim rugs that are manufactured with superb materials and striking curving flower leaf and leaf spray designs. Oriental Rug: Often referring to the entire rug market, Oriental rugs differentiate themselves from Persian rugs by being produced in Asian countries and other areas of the world outside of Iran. Oushak: One of the more popular rugs available in the marketplace, and are often produced by hand in the city located in western Anatolia by the same name. Paint: Also referred to as painting or being painted, when a rug’s color is changed after it has been completed using dyes to hide undesirable colors. Palmette: A rug motif resembling the fan-shaped leaves of a palm tree, but it can also be conveyed as a lotus flower in some rugs, using both geometric and curvilinear design. Pile: The surface of a rug, created by knotting wool around warp threads and wefts inserted between knotted rows. Pomegranate: A fruit used in natural dyeing processes, where the skin is soaked and sometimes mixed with a mordant to produce brown, red and black shades. Prayer Rug: Though common in many religions, prayer rugs typically refer to the small rugs used by Muslims during prayer recital. Qashqa’i: A tribal confederacy in southwestern Iran known for weaving rugs of the same designation and often featuring hexagonal medallions at their center. Quatrefoil: Often used in architecture, a four-leaved or four-lobed design reminiscent of clovers or flowers. Raj: A common method of measuring a rug’s knot count in Iran, where one raj equals the number of warp threads contained in a 7 centimeter square. Ram’s Horn: A motif typically located at the top and/or bottom of a rug and representing fertility, heroism and power. Reciprocal Design: A design using contrasting colors but inconsistent in the way the patterns are repeated across the rug. Repair: Can include restoration, re-selvedging and re-piling. Where a rug is given to a professional who ensures the rug’s structure is maintained. In the case of restoration, re-selvedging and re-piling, the reknotting or re-dyeing of a rug to bring it back to its original condition. Rosette: An arrangement of a single motif or collection of motifs spreading outward to suggest a rose design. Runner: A rug designed for longer living spaces, typically found in hallways and ranging from a ratio of 5 to 1 or 3 to 1 in length versus width. Saf: A prayer rug with a design featuring multiple prayer niches. Sarouk: A village located in close proximity to the Iranian city of Arak. Also where Sarouk rugs are produced, which have always maintained high popularity among Westerners. Selvedges: The edges of an Oriental rug where warp threads are wrapped in colored wool to prevent unraveling. Senneh: The capital city of the Kurdistan province in Iran, where numerous rug types are produced, and particularly Kilim rugs of remarkable quality. Serab: A region in northwestern Iran located near the Caucasus where Serab rugs are manufactured by villagers and nomadic peoples. Serapi: A rug produced in the village of Heriz, largely during the 19th century, and often designated as such by employing the same design elements as a Heriz, but featuring more knots-per-inch and materials of higher quality. Sardinia: The second-largest island off the coast of Italy where Sardinian rugs were crafted by early settlers, including the Phoenicians. Shiraz: The capital of the Fars province in southern Iran, and where Shiraz rugs are manufactured by nomadic and semi-nomadic weavers living nearby. Sofreh: A flat-woven, rectangular cloth that food is served or prepared on, translated from Farsi to mean “spread” or “tablecloth”. Soumak: A Kilim rug that has been painstakingly embroidered by its artist after completion to further add to its value and beauty. Spandrel: An ornamental motif or design located on the corners of an Oriental rug’s field. Sultanabad: A city in Central Iran where large carpets of the same name were manufactured in great quantities in the late 1800s through the early 1900s. Symbol: An artistic interpretation suggesting a physical object or philosophical idea. Symmetrical: In rugs and carpets, a balanced approach to laying out a design where two or more sides exhibit the same features. For symmetrical knotting, refer to Ghiordes Knot located above. Tabriz: A city located in northwestern Iran known for its centuries-old weaving tradition and where Tabriz rugs are woven in varying designs. Tapestry: A handmade or machine-made wall hanging that is in many cases made in the same way and from the same materials as Oriental rugs. Tea Wash: Submerging a rug or carpet in a heavy concentration of tea after it is completed in order to give it an antique appearance. Tufted: Similar to hand-tufting but the work is performed by a machine. Turkey: Located east of Greece, a country renowned for producing high-quality Turkish rugs, which are sometimes referred to as Anatolia rugs. Turmeric: A tropical plant native to India that is sometimes used to dye materials yellow for Oriental rugs. Varamin: A large village located near the Iranian city of Tehran. Also refers to Varamin carpets, which were produced in the 16th and 17th centuries. Verneh: Also known at times as a Sileh rug, Verneh rugs are flat-woven carpets that many times feature S-shaped motifs or geometric designs. Village Rugs: Any rug created in a village or small workshop, typically by a single artist or small team of artists. War Rugs: During the Russian occupation of Afghanistan, rugs woven by Afghan villagers that display an array of modern weaponry in their designs, including tanks, jets, helicopters and guns. Warp: The lengthwise threads that make up the foundation of a rug and also form the fringes of the rug when it is completed. Knots are tied on the warp to create the pile. Wear: In rugs and carpets, how much the pile and other elements of a rug have been worn down or mistreated. Weft: The threads running width-wise and perpendicular to warp threads that assist in creating a rug’s foundation. Knots are secured in place by the weft. Wool: Known throughout history as the “miracle fiber”, wool comes from a variety of sources, but most often from sheep and camelids (members of the camel family). Wool coming from goats is usually referred to as cashmere or mohair, while muskoxen provide qiviut and rabbit wool is branded as angora. Yalameh: In western Iran, a word used to describe village rugs whose designs feature motifs from the Khamseh, Qashqa’i and Lori tribes. Yastik: A Turkish rug commonly used to cover a pillow or cushion and usually measuring 3’ x 1’. Yuruk: Translated from Turkish to mean “nomad”, this word refers to any nomads living within the boundaries of Turkey. Zaronim: A zar is roughly one square meter, while a zaronim is 1-1/2 times the size of a zar, or approximately 1-1/2 square meters. This term is used to describe rugs that are roughly 3’ x 5’ in Western measurements. Ziegler Carpets: Exported by a German company whose main office was located in England, Ziegler carpets are renowned for being some of the stunning and collectible in the past two centuries. They largely consist of Tabriz, Mahal and Sultanabad rugs produced by Middle Eastern artists and under the direction of the Ziegler Co.